We hear a lot about the perils of Storrow Drive this time of year, and for good reason. Thousands of people unfamiliar with the concept of “Storrowing” arrive in Boston for the first time, and there is an obvious benefit to sounding the alarm about those moving truck-smashing overpasses as loudly as possible come late summer. That’s why the city has been aggressively sending out PSAs about the treacherous parkway (and, thankfully, it looks like we’ve made it through peak Storrowing season without incident). But clearly moving trucks are not the only threat posed to the rest of us by newbies taking to the streets. A photo shared with Boston this morning shows a man making his way down Storrow Drive on a bicycle during rush hour. 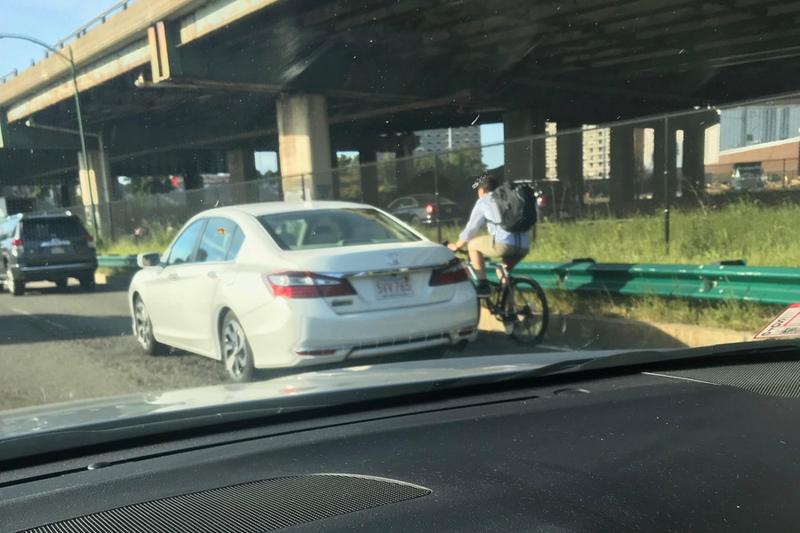 Snapped around 8:40 a.m., the picture shows the biker pedaling precariously in the narrow space between cars and a guard rail in the right lane. The unidentified man—wearing a backpack, long-sleeve blue shirt, beige shorts, and no helmet—appears to be in big trouble here. It was not immediately clear how or when he made it out safely, but state police say there were no reports involving bikes on Storrow today. Storrow is, of course, off limits to bikes. It does not have any painted bike lanes, and “do not enter” signs leading on the parkway, which is run by the Department of Conservation and Recreation, indicate that bicycles, pedestrians, and horses are all banned from using it. There are plenty of perfectly good bike paths running parallel to it on the Charles River Esplanade, too, so there’s really no reason to be there. Still, troublingly, it looks like there were at least two other sightings of bikes on Storrow this summer. College freshmen, new arrivals of all stripes, people giving Blue Bikes (née Hubway) a try, commuters who maybe celebrated a certain Boston-approved holiday a little too hard, take heed: Learn the rules of the road and do not kill us or yourselves on the highway. Thank you. And welcome to Boston.